I used to always love cheesecake. It was my absolute favourite dessert and I couldn't get enough of it. Back in my twenties even after I cut back on dairy it was my weakness. When I lived in LA for six months (for more on LA see >here<) I first tasted vegan cheesecake and my mind was completely blown away. I couldn't get over the texture, how rich and satisfying it was and also that the next day I didn't feel bloated like I did when I had cream or milk. I have always loved lemon tart. It's the gorgeous contrast of the sharp sour taste of the lemon mixed with the sweetness of the base but wanted to find a vegan version. I've made this three times now and it's really special. 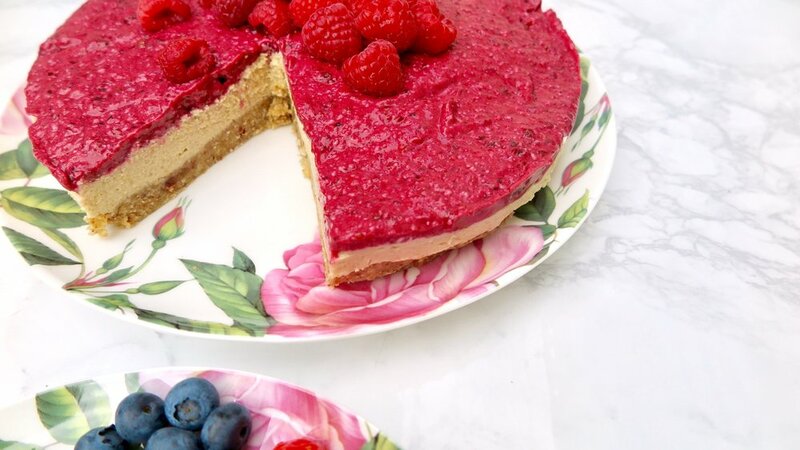 As Summer berries are in full bloom I thought adding a berry layer would add even more flavour and depth. I used frozen berries here as they're cheaper but fresh will also work well. 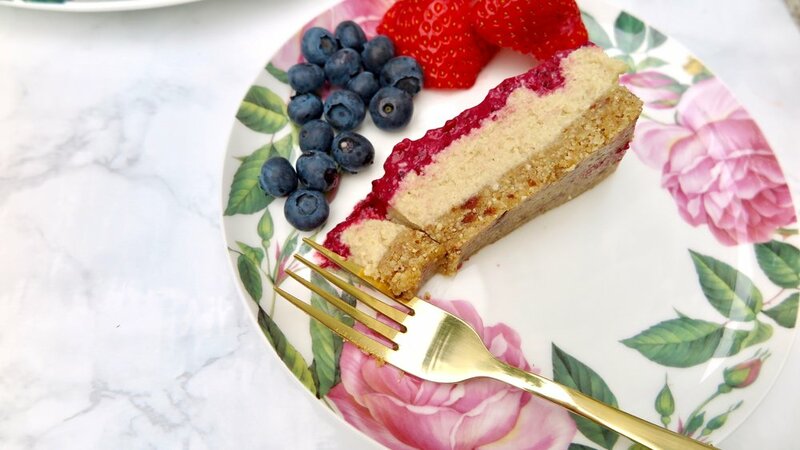 This is perfect served with even more berries and vegan or not everyone will Love it. 100g frozen or fresh berries. Soak the 300g cashew nuts for the lemon layer and set aside. Line a 9" round cake tin with greaseproof paper. Blitz the cashews and macadamias in a food processor until a fine flour like texture is formed. Add the coconut, maple and the dates and continue to process. The mixture will stick together and form a thick dough-like consistency. Press this evenly into your cake tin pushing down firmly to make sure there are no gaps and place in the freezer. Drain the cashew nuts and process them with the lemon juice, maple syrup and vanilla essence. Once a thick creamy consistency is achieved (after about 30 seconds) fold through the lemon zest. Pour the filling over the base layer and return to the freezer. Blend the cashew nuts and then add the mixed berries, dates, lemon juice and process until it's smooth. I like this to be quite sharp but if after tasting you would like it sweeter just add another date or two. Pour on the berry layer and return the cake to the freezer to set for an hour. Top with more berries if you like and Enjoy! This cake freezes well but if you are serving it allow to defrost for up to 30 minutes beforehand. Tips: I used frozen berries here as they are cheaper but fresh will work perfectly also. Always make sure to take the stones out of the dates as not only can they damage your blender they will ruin the texture in a moment! I really hope you enjoy this! Let me know if you make it!